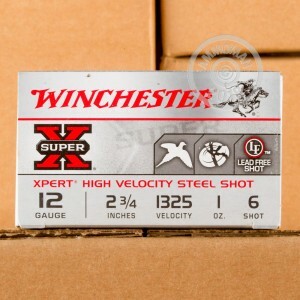 These 12 gauge waterfowl loads from Winchester are a great choice for duck hunting. 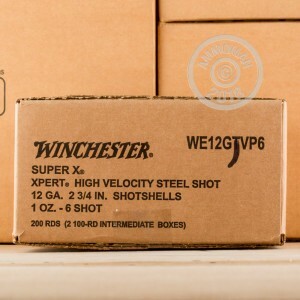 Each 2-3/4" shell in this box of 100 fires a one ounce column of #6 steel shot at a muzzle velocity of 1,325 feet per second. Compared to most waterfowl loads, these shells produce low recoil but still deliver strong penetration against smaller birds due to the slightly larger size of the shot fired. 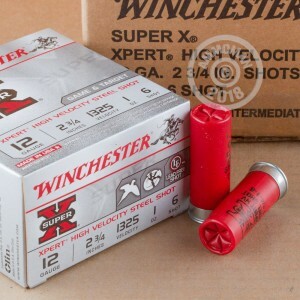 Winchester Super-X shells are loaded in Oxford, Mississippi using dependable 209 primers and one piece hinged wads designed to produce tight patterns.